Naming a product or company can be confusing, so our brand naminig experts demystify the process and provide insights with “must-know” Brand Naming Answers and Facts . For example, we often get asked how the Brandings Brand Naming service works, and about the different creative names we have. With that said, we’ve grabbed the team and put together this Brand Naming Answers and Facts page. It’s dedicated to answering all those questions and much more. We thought we’d pull together our team, collected all our past questions, then present the most frequently asked questions here today. On the off chance we haven’t answered your specific question, or your ready to move forward on a brand name you like on the site, just reach out to our experts. Don’t worry, we’re friendly. 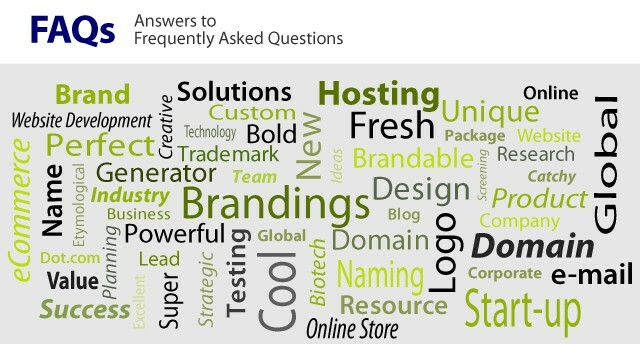 So, without further ado, Brand Naming Answers and Facts, the most frequently asked questions. Q: Is Brandings® right for me? A: If you are starting a new business, launching a product, or you want to give your existing company a fresh new brand identity — Brandings® can help. As part of your brand package, you’ll receive a compelling brand name, in addition to the exact match dot-com domain name. In addition to a custom logo, starter website, and most consequently all “TM” trademark rights, even more. Q: How is Brandings® different from a traditional company naming agency? A: When “Fortune 500” companies launch a new product or develop a new business line they hire teams of naming consultants, corporate image developers even marketing professionals. They do this to get it right. We believe these brand naming services are worth every single dollar. However, these services can range from thousands to millions of dollars; well out of reach for most startups. In comparison to other Brand Development services, Brandings® has undertaken research up-front. We’ve already developed thousands of unique, differentiated and available brand names. We skip the fancy-presentations and big-budget meetings of “old school” naming and brand development firms and pass the savings on to you. We save money and a lot of time. Q: Entrepreneurs often ask, what’s the facts behind “brand” and “business name” difference? A: Your “brand” is everything your audience thinks about when they see or hear your company “name.” It’s all of the feelings, emotions and perceptions they have about your company. This includes everything your customers come in contact with. This includes your name to your logo, from the shape of your product to billboard on the side of a building. For a new startup, the first (and perhaps only) perception a prospect will have of your firm comes from what they see and hear your brand name, domain name, logo, graphics, colors, style and sounds. Selecting the right brand name is one of the most important decisions that you’ll make as a business owner. Our team will work with you to develop a brand logo design and identity that delivers a clear message, provide credibility, and connect emotionally with your target audience. Q: How do I search for a brand name on your site? A: Your search for the perfect brand name has never been easier. Because you asked we’ve answered by braking down our categories, into more and different categories. Now you can browse our wide selection of brand names by category or subcategory in our Categories Page. We’ve also listed all our categories on the right side of this page. Q: What if I can’t find a name that’s right for my business? A: If one of the hundreds of names from our pre-developed inventory doesn’t quite fit your needs, don’t worry. Simply drop us an email and we’ll pull some names for you and get back as soon as possible. While all our names are currently listed on the site, we know it can be quite daunting looking through the names sometimes. In addition, you can put our brand development team to work for you. For example, our etymologists and naming gurus will work collaboratively with you to develop a set of fresh, new, 100% unique brand names specifically for your business. Q: What countries does Brandings® serve? Q: Are the brand names available immediately? A: Yes. At Brandings® we’ve “predeveloped” thousands of unique company names. Each business name has been screened for use and tested. Our experts have built these names base on years of research, hence you’ll have the most powerful platform to launch your venture. Q: What does the “TM” trademark symbol mean? A: Each brand name in the Brandings® inventory bears the “TM” designation. This establishes Brandings® claim to the discrete word, letter, number, design or combination of these elements. The “TM” symbol is global notice of commercial use and common-law claim of trademark rights. All rights held by Brandings® will be transferred to you as part of the brand package. You’ll receive a Certificate of Purchase and Transfer of Common-Law Trademark Rights thus transferring all rights, titles and interests to you. Q: Question, are brand names screened? A: Each name in our online catalog has been screened by Brandings® for foundational “ownability.” Should your needs require more robust trademark screening, Brandings® offers a wide range of advanced trademark screening services. Regularly we recommend that clients conduct a basic search by themselves. By simply by typing the company name into a search engine like Goggle, Yahoo or AltaVista you’ll find lots of information on your name ideas. Finally we suggest that you take full advantage of the free search functions available at the European Office for Harmonization in the Internal Market (Trade Marks and Designs) at EOHIM Search. Similarly the United States Patent & Trademark Office (USPTO) database can be found at USPTO Search. Just pop your brand name idea in the search feature and see what, if anything comes up. Brandings® makes no representation as to the suitability of a brand name with application in a particular industry or market. Neither do we represent suitability for use in a category of good or service as articulated in the International Classification of Goods & Services. We strongly advise you to seek counsel to determine suitability and all trademark registration related matters. Q: Will I own the domain name forever? A: For a fact, yes. As long as you keep your domain registered with a registrar such as GoDaddy, 1&1 or NetworkSolutions. In addition, as long as you’re not engaged in domain fraud you’ll have ownership and control for life. Domain names are like any other asset such as a car or real estate, it can be developed, sold and/or bequeathed. Domain registrars charge an annual fee of about $15 (USD). Ensure this nominal fee is paid accordingly each year. Should you fail to keep your registration current, you consequently risk losing your domain. Q: How does the domain transfer process work? A: Once we receive your order, we’ll initiate the permanent transfer of the domain name to you. We make the domain transfer process as quick and easy as possible usually within 2 to 3 business days. Honestly it takes less but we live by, under promise, over deliver. If this is your first domain transfer, no worries, we’ll walk you through the process. We’ll even help you set up an account then transfer to your domain registrar. The most recognizable Domain Registrars are GoDaddy.com, NetworkSolutions.com, 1and1.com, eNom.com, Joker.com, and Register.com. Domain registrars charge an annual registration fee of about $15. (USD). We’ll then transfer the domain to your registrar where you’ll have full ownership, title and complete control over the domain. Q: Should I consider starting my business using one of the new domain extension like .build, .business, .co, .magic, .fish, .vegas, .info? If you don’t own the dot-com, you’ll be sending almost everyone looking to find you, to the company that does own the dot-com. With new “dot-something” extensions coming out every day, dot-com domains have become even more coveted than ever before. Is it possible to succeed on a different extension, sure, you can succeed using a “dot-something” TLD, but the odds are weighted very heavily against it. You want to launch your startup on the right footing. Q: Can I change the brand design? A: Yes. Once you have found the perfect name in our catalog, our design team will work with to refine or recreate the perfect brand logo and identity. Q: How will I use the brand Concept Board and Design Palette? A: Our graphics team will capture the core elements of your brand identity. We presented this to you in a compact brand Concept Board and Design Palette. One of the characteristics of the most successful start-ups is consistency between company strategy and brand identity. It’s of the utmost importance that there is congruity at every brand touch point. You’ll want to provide the palette to your printer when you create your promotional material. Show the palette to your contractor when building out office or retail space. You’ll also use it when you’re making packaging decisions or developing products. Q: Will Brandings® charge me to make design changes? Are there any additional fees or expenses? A: There are NO additional fees or charges from Brandings® of any kind. Your brand package comes complete. As with all domain names, you’ll have a domain registration fee of about $15 (USD) a year. This you’ll pay directly to your domain registrar. And if you maintain an active website, you’ll have a monthly fee for hosting. The cost of website hosting starts at about $12/mo. Q: We have our own graphics and website team, do I need to go through the design development process? A: In short, No. These services are available to you only if you require them. Some clients have a website already in place. Others have an in-house design team for their brand identity and logo design. At your direction, we’ll work with your team so that we provide them with any support they may need. Q: How will I receive the final brand logo artwork? A: You will receive logo artwork in the following formats: .gif, .pdf, .ai, .eps, .svg, .png & .jpeg. If you require a unique or special format, just let us know. We can prepare artwork in any file format you need. Q: How does Brandings® determine the price of a name? A: After we’ve created, screened and tested a company name we work aggressively to obtain the dot-com domain. Simply stated, there are a finite number of premium dot-com domains and virtually all of the best have been taken. Q: What forms of payment does Brandings® accept? A: We accept Visa, MasterCard, AmericanExpress, and Discover as well as payment by check, wire, PayPal and Escrow.com. We hope we’ve answered your questions and presented all the facts. Now it’s simply up to you to begin your search for a company name. Just find the category that best fits your business. Simply select a category or subcategory and browse! Don’t forget, you can also find names that contain a keyword or partial word.